ARTVIN, Turkey, Mar 4 2016 (IPS) - Over the past weeks, thousands of people across Turkey have protested against the planned construction of a gold mine in Cerattepe, close to the town of Artvin in the northeast of the country. Protesters fear that the mine will cause irreparable damage to the unique natural environment of the region. 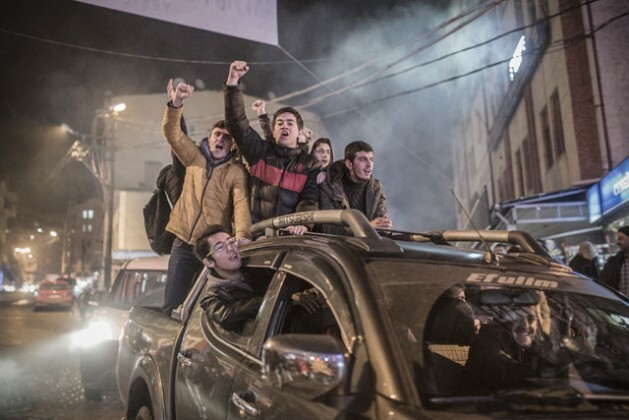 The protests in Artvin started peacefully on February 15, but these quickly escalated after a violent crackdown by police forces that had been brought in from the surrounding provinces to quell the popular uprising. In the following days, environmental activists from all over Turkey descended upon the town to support the locals in their resistance, leading the governor to ban anyone from entering the province. Construction of the mine has allegedly been suspended after a meeting between Prime Minister Ahmet Davutoğlu and local representatives of the environmentalist Green Artvin Association. But the government’s violent response to the protests has raised fears that it is reluctant to give in to local demands and that it will try to push on with its plans to construct the mine regardless of any legal objections. Cerattepe is rich in mineral resources, in particular gold, silver and copper. The first attempts at exploiting these deposits took place in the early 1990s, but these were suspended after several years when it was exposed that the pollution from the mines was the cause of a higher number of deaths among local livestock and wildlife. In the mid-2000s another company resumed the work, but after thousands of locals took to the streets in 2007 a legal procedure commenced which eventually led to the company’s license to be revoked – a decision that was confirmed by the Council of State in 2009. Since then, the legal struggle over the right to mine in Cerattepe has been an endless back-and-forth. A change of the mining law by the AKP in 2010 lead to new tenders being held in 2011; a court ruling in 2014 subsequently halted operations after which an environmental impact report was rejected in 2015, with a new report eventually approved last June. Without waiting for the outcome of the legal proceedings regarding the approval of this final report, construction workers from Cengiz Holding – the Turkish conglomerate that owns the company that will build and run the mine – arrived in Cerattepe on February 15, to start the construction of the mine. When these workers were met with protests from the people of Artvin they returned the next day under protection from the police and gendarmerie, who then started attacking the protesters. What ensued were several days of intense confrontations between locals and environmental activists on the one hand and security forces on the other. Several people were injured when the police and gendarme resorted to the use of water cannons and rubber bullets to disperse the protesters. Even though the temporary lapse in the construction of the mine has been lauded as a victory for the protesters, there’s ample cause for concern. Bozoğlu pointed out that this statement could indicate that rather than Cengiz Holding changing its plans to abide by the law, the law might instead be reformulated in such a way as to fit Cengiz Holding’s plans. Moreover, giving a clear indication of his intentions to see the construction of the mine go ahead regardless of any legal and environmental objections, Davutoğlu stated that “if someone still says we want the underground richness to remain under the ground despite all these cautions, it is impossible for us to accept this”. In a carefully orchestrated campaign authorities and pro-government media worked together to denounce the protesters’ legitimate demands. While Davutoğlu referred to the demonstrations as “illegal”, President Recep Tayyip Erdoğan claimed that the people of Artvin were “exactly the same as Gezi … they are a junior pro-Gezi”. The Gezi protests in mid-2013 started as a small-scale environmental protest in Istanbul but soon turned into country-wide anti-government movement that brought millions of people to the streets across Turkey. Gezi supporters have been accused by the government – and by Erdoğan in particular – of attempting to stage a coup and to be under the control of external forces that seek to undermine Turkey. The possible construction of a mine in Cerattepe poses a serious threat to the region’s natural environment as well as the local people’s health and livelihoods. But this is not the most serious issue at hand. The government’s response to the protests in Artvin fits a pattern that sees all forms of resistance criminalised, all dissenters designated as terrorists and that causes the authorities to respond to any form of social unrest with disproportionate violence. Billion-dollar conglomerates such as Cengiz Holding that maintain close ties with the country’s leadership have charges that were brought against them for large-scale corruption dropped with no questions asked, and have hundreds of millions of Turkish liras in tax debts erased. At the same time, individuals that dare to speak up are silenced, prosecuted and jailed. It is the same authoritarian mentality that has led the government to refuse to listen to the demands of the country’s Kurdish population, that prosecutes minors for “insulting the President”, that ordered the ultra-violent crackdown of the Gezi protests and that sees journalists and academics jailed for speaking up and exposing the truth. It is this same mentality that has now brought Turkey to the brink of civil war.